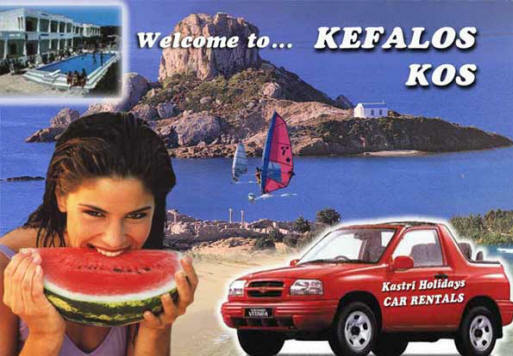 We are a Travel Agency & Car Hire Company from KOS, one of the most beautiful and cosmopolitan islands of GREECE. We represent Hotels, Studios and Apartments of KOS especially from the west part of the island the magnificent KEFALOS bay. KEFALOS is an excellent choice of accommodation for those looking for a relaxing and enjoyable holiday. The resort of KOS with the most attractive beaches is only 15 minutes from the airport. It's a heaven for those who want to enjoy the sea and all the water sports at 17 Kilometers of clean, unspoiled beaches with fine golden sand. The wide variety of traditional fish-taverns, restaurants and bars satisfies the Visitors needs for fresh food and entertainment. The majority of the Accommodations in Kefalos are newly build hotels, studios and apartments family operated just 50 to 200 m from the beach at prices starting from 25 Euro per day per studio or room. Our fleet is consisted from brand new vehicles fully insured at great prices especially for weekly rentals where we offer discounts up to 25%.